About 40 minutes south of Puerto Vallarta, the W Punta Mita in Nayarit is a luxury hotel with a funky, colourful interior décor that overlooks a beautiful beach with unforgettable sunsets which makes it the ideal location for your beach wedding. With the beach and the sound of waves breaking at your doorstep, the hotel is inspired by the local surf culture which is so renowned on Mexico's Pacific coast. With distinct designs, paintings, artisanal works and a colourful elevated mosaic walkway that overlooks the pool area and the beach, the W Punta Mita boasts endless photographic possibilities for your Wedding day. 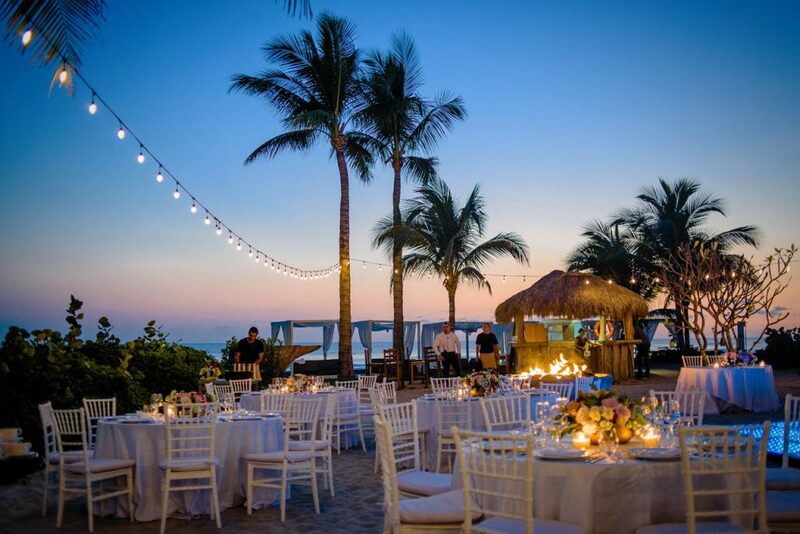 If you are having a rehearsal dinner the evening before your wedding at the W Punta Mita, you have a choice of restaurants where to host your event, with signature cocktails which cannot go untouched. While wedding photographers will only cover a couple of hours of your rehearsal dinner, it is an excellent opportunity for everyone to enjoy an evening in a less formal setting and get some great photos of your family and close friends in a colourful venue prior to your big day. Each room in the W Punta Mita lets in copious amounts of natural light through the large beach-facing windows just outside some of the rooms, and there is a small patio and private pool too! No room design is the same, with a vibrant interior décor designed and painted by local surf inspired artists from the nearby town of Sayulita that will add character to your wedding photos. The colours and design in the rooms are definitely cheerful and Summer inspired! Your wedding photographer will be in his element here during the getting ready wedding photos. If you are having a First Look before your wedding ceremony on the beach, the W Punta Mita has a multitude of options to choose. From an intimate and secluded green grass area that will make the occasion between just the two of you, to something more public and panoramic that makes use of the colourful, elevated mosaic walkway (Camino Huichol) that overlooks the hotel pool and beach. Your wedding photographer can give you ideas as to where to do the first look, or you can also run your own ideas past him should you have any. Once you have had your first look or you are done with the getting ready photo session, its time to head down to the beach. Wedding ceremonies at the W Punta Mita take place on the public beach in front of the hotel. A serene palm-tree rode beach with crashing waves and magnificent sunsets as a backdrop, certainly nothing to grumble at! The entire wedding party will generally walk alongside one side of the pool to reach the beach where the wedding gazebo is located. 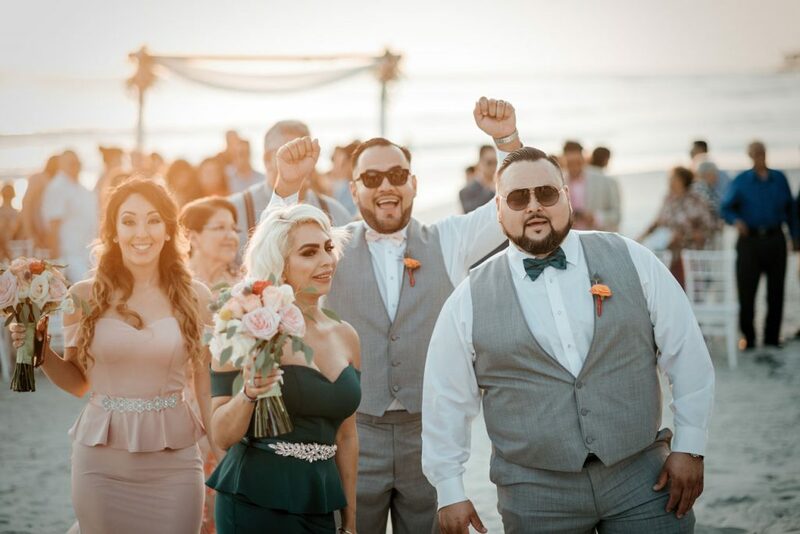 Once more, an excellent opportunity for some awesome wedding photos of the groom and his groomsmen and the bride and her bridesmaids as they slowly make their way to the beach. The wedding ceremony on the beach generally lasts 30 minutes, but this may vary depending on the type of ceremony you intend on having. If you are into beautiful sunsets, it is worthwhile speaking with your wedding planner to coordinate the wedding ceremony during the evening. Once your beach wedding ceremony has ended, your wedding photographer will round up the bride and groom and your wedding guests for your family and wedding party photos, most likely on the beach, but that is at your wedding photographer's discretion and of course, timing! Whilst other guests can enjoy a refreshing drink in the cocktail hour on the elevated mosaic walkway overlooking the beach, maybe to some mariachis to liven up the atmosphere a little bit. Once you are done with the family and friend portraits, your wedding photographer will start on the bride and groom portraits. There are once again, an endless number of locations here for your portraits: from the private sun huts just behind the beach, the surf hut where the hotel surfboards are rented, the blue 50´s Chevrolet pick-up that makes up the beach bar, the extravagant hotel lobby, and hotel restaurant next to the lobby, to name just a few locations at the W Punta Mita. Follow your wedding photographer's lead he will give you directions on where to stand, sit or what to do… don't think of him “posing” you, wedding photographers will direct you in such a way that provokes a natural reaction, and a photo perfect moment. The hotel lobby at the W Punta Mita has a colourful blue mosaic floor which is an extension of the walkway on the exterior. This continues through the interior lobby bar up the lobby steps up to reception. The way natural light filters through this area is very aesthetically pleasing and very worthwhile getting some photos here while the in-house DJ pumps out some vibrant electronic tunes… This area characterizes what the hotel is about. You should allocate at least 1 hour for your bridal portraits, to make sure your wedding photographer has enough time to get the necessary shots to complement the venue and your wedding collection. 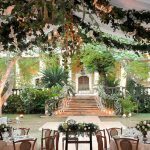 With your newlywed portraits over with, your wedding reception will most likely occupy a private area of the hotel next to the beach at the Chervicheria where the part Chevrolet pick-up/part bar is located or the large green garden area off the beach with a lake view. Both locations are ideal for guests and wedding photographers, as the Chevicheria is still located next to the beach with palm trees surrounding you and the elevated walkway allows your wedding photographer to get a high viewpoint of the wedding reception, tables, dancefloor, guests and the wedding décor! If you are planning on splashing out on fireworks during your first dance to impress your wedding guests, these will be launched from the beach in front of you. Another cracking photo opportunity! Your first dance and colourful fireworks exploding high in the sky above you! From a wedding photographers point of view, the W Punta Mita is a premium photogenic wedding location in the Riviera Nayarit that is hard to beat. Its vibrant fusion of summer colours, rich Mexican culture, local artisanal crafts mixed with a stylish and elegant design is a perfect complement to your destination wedding on the beach in the Riviera Nayarit. The photographic possibilities here are endless and only limited by a wedding photographer's creativity and vision. If you have recently reserved the W Punta Mita as your wedding venue and are looking for a wedding photographer, I would love to hear from you! I have experience shooting weddings there and will gladly meet you for a no-obligation chat about your wedding day and what your expectations are. Feel free to get in contact to discuss. Feel I have omitted something about the W Punta Mita as a wedding venue? Care to share your experience?